Four Winds Brewing company have one of the most instantly recognisable brand identities in the BC Craft market. Created by Andy Dixon back in 2014, Four Winds’ packaging designs often feature bright ‘n’ bold geometric patterns tempered by an elegant, almost regal blue which has since become synonymous with the brand. A couple of years ago, the immensely talented Justin Longoz stepped in as Four Winds’ resident designer and has done a tremendous job of not just maintaining, but building on and developing the Four Winds brand. This summer, the Delta based brewery dipped a toe into the world of canning with the stunning Notus series – four incredibly drinkable summer six-packs, featuring Longoz’s stellar design work. Hey Justin! The Notus series cans are absolutely stunning. Are your designs for the series inspired by anything or anyone in particular? With the Notus series, I knew I wanted to do simple geometric shapes and bright colours on white backgrounds because I hadn’t really seen anyone in BC doing that yet and I knew that would stand out. I knew I wanted to start doing labels with no words on the front like I had seen with the works of label designers from European craft breweries. Keith Shore of Mikkeller, Karl Grandin of Omnipollo and Kasper Ledet of To Øl are the three designers that definitely come to mind right away. I like the idea of creating simple and eye-catching imagery that leaves people thinking “what the heck is this?” and invites them to pick it up. Just how abstract are the designs? The Vélo design seems to reflect the contents in the colours (lemon and Himalayan salt) and is clearly round like a bike wheel - are the others similarly representative of the beer, but in a slightly more subtle way? The designs are definitely abstract but I tried to create designs grounded in the concept, flavor, colour and/or content for each beer. Vélo’s design is a representation of both a wheel and of peeling citrus fruit, pulling the eye around the can from left to right. The colours are shout-outs to the beer’s ingredients. The Featherweight design is centered around its main flavor component: the hop. Here I’ve created an abstract hop that breaks apart and allows the eye to flow to the side of the can revealing the description. Sharp edges, like the bitter hops in the beer, float away revealing how light and fruity it is. The Elementary Lager design is based around simple rounded triangles to reflect the idea of the name and its style. A triangle is one of the most basic shapes you can make and the rounded edges speak to the soft, light flavour of the beer. I felt I needed to echo that in the design by keeping it clean and uncomplicated. La Maison’s design has an almost celestial/planetary component to it, where the colours are representative of how I perceive the flavor, colour and general feeling of the beer (summer). La Maison is also a staff favourite at the brewery so I feel the planetary aspect reflects how immensely important this beer is to everyone here at Four Winds. Despite being the same design as the bottle labels, to me, the designs feel like they've been "set free" on the cans. The design elements float off around the can, they're not hemmed in by the dark glass. Do you feel there are particular advantages to designing cans over bottles? That’s tough to answer directly because I feel like there are advantages and disadvantages of designing can vs bottle labels. The Notus series beers are the first that we’ve put into cans and we opted to get the designs printed directly onto the cans. I found that challenging. There are a lot of guidelines with things you HAVE to do and things you CAN’T do when you do direct printing. The labels that you put on bottles are essentially just stickers so you have loads of freedom to play with shapes, colours and textures. I enjoyed the challenge, but prefer sticker label designs. With that said, I like the idea of cans a lot more for the reason you stated above. The bottle itself is an odd shape and limits the canvas you have to work with. The can is a piece unto itself. You can cover all or most of it in design. When we start releasing limited release beers in tall cans we will be using the sticker labels and I’ll be able to play a lot more with the cans. I’m very excited about that! What are your thoughts on the idea of "cans as a canvas"? I couldn’t agree with this sentiment more. There are so many breweries releasing an endless number of beers. It seems like the more you use the can as a canvas, the more you’re going to stand out. As the industry grows and mutates, so do the brands and ways to push them to their fullest extent. 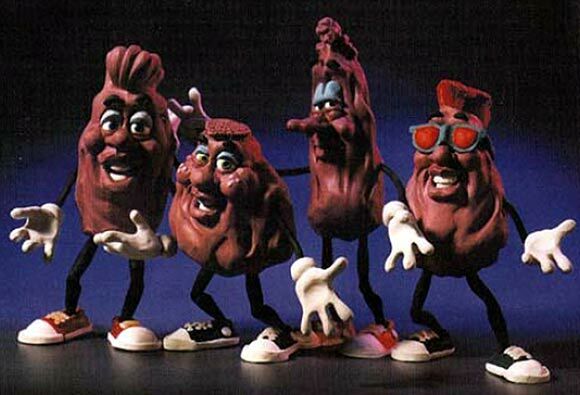 I’m trying to push the Four Winds brand as far as I can. I want people to see our labels from across the store and think “What is that? Probably Four Winds” without seeing any text or logos. Something else to consider is that brewing is an art form. It just seems to make sense that you would wrap a work of art in more art. A great example of this is Kasper Ledet who I mentioned earlier. Look at what he is doing for To Øl in Denmark [check out his instagram here]. Every single label he designs is a piece of art with a purpose. It’s beautiful, it’s meaningful and it’s transformative. He’s probably one of the best examples of an artist who uses the can as a canvas. What were you doing before Four Winds? Do you do any design work outside of Four Winds? I used to be an animator in Vancouver and have had many jobs working everywhere from bakeries to liquor stores. One thing that has always been constant is my design work. I’ve been a designer since I was 16. It started small with t-shirts or concert posters for friend’s bands and that sort of evolved into company branding and packaging design over time. Most of my work outside of Four Winds right now involves charity work or branding and packaging design. We talked a bit about the Notus Series inspiration before but I feel like I have to mention one more person that has a broader influence on me. All of my Four Winds work is directly inspired by the work of Andy Dixon who did the initial branding and packaging for Four Winds and is an immensely talented artist. He was a huge inspiration to me growing up. It’s an honor to take over for Andy and I’m glad that I’m able to do what I love for my favourite brewery! Speaking to Justin, it became pretty clear why I was so taken with his design work. His list of inspirations is my list of inspirations. The kind of work Keith Shore, Karl Grandin and Kasper Ledet have been doing over the past few years is a large part of why this blog exists. And this won’t be the last time you read those names. Keith Shore, Karl Grandin and Kasper Ledet. See? And it’s clearly not just me who’s been taken by his design work. A quick ‘n’ casual canvassing of local liquor store employees suggests that the Notus Series six packs have been flying off the shelves. Sat in a chiller alongside a range of busy, information dense six pack boxes, each jostling for attention, a wild look burning in their eyes as they shout “LOOK AT ME, LOVE ME”, the Notus Series cooly looks up from its phone, makes eye contact, gives you a quiet, confident nod and walks you off to the counter where it will offer to pay, but can’t because it’s just a box of beer personified in a tenuous metaphor. A large part of the liquor store game is about occupying shelf space and that’s one of the few potential downfalls of cans vs enormous branded bomber bottles. The Notus’ Series boxes, however, seem to be the ideal solution to that issue. Presented together, they turn almost an entire chiller shelf into an oasis for the eyes, a little one row art exhibit. No wonder they’re doing so well. It’s clear that Justin Longoz has a lot more up his sleeve and I for one am extremely excited to see what will come of Four Winds’ eventual tall can releases. A huge thanks to Justin for being so forthcoming and to Alison Page for providing such phenomenal photos. Have you tried the beers? Have you built yourself a funky robot costume out of empty six packs? Let us know in the comments! Thirsty for more? Delve into the archive for more design magic. Every so often a can comes through the warehouse that ticks all my personal can design boxes. That checklist is, admittedly, incredibly fluid and changes on a whim, but recently a stunning pair of cans came through that really tickled my fancy. Red Collar Brewing Company’s can designs are bright and bold with a colour scheme that sits slap bang in the centre of my preferred colour palette. Impeachment’s can glows an irradiated peach colour, tempered and softened by a turquoise leaning teal that soothes the eyes, while Alternative Facts’ otherwise calming, pale green crashes through your eye sockets like a perma-tanned bull in a political china store, supercharged as it is by contrasting black bands and bold all-caps type. Well executed tongue-in-cheek copy tops it all off, confirming every suspicion you might have had that these beers might be poking fun at a certain someone or something. With a fresh’n’fruity can of Impeachment in hand and another few in the fridge, I got in touch with Frank Luca, Red Collar’s in-house designer, to see if I could dig up some actual facts about the can design process and the story behind these beautiful beers. Hey Frank! This is Red Collar’s first foray into the world of canning and you’ve absolutely crushed it first time round. Thanks! We'd had it on our radar that we wanted to be putting a product in cans for a while. We figured it would also be a great opportunity to release two brand new beers as well. We knew we wanted to do our take on a hazy IPA so our goal was to release a coinciding product that complemented it but would also be easy drinking enough to be considered a summer beer. The result was this slightly sour wheat ale. Easy drinking is right! It’s fairly clear who these beers are referencing, but the names are inspired. What’s the story here? We thought the name Alternative Facts was just too good not to use so we had a lot of fun brainstorming ideas for the copy and the image for that one. We did think about putting our Apricot Sour Ale in the cans but felt that product should just remain in bottles so when thinking about what other flavours we could incorporate into a sour beer, the idea of a peach came up and I believe it was my colleague Lara Beardsell, who co-wrote the copy for both, that jumped in and said we could try calling it Impeachment. Obviously, all of us loved the idea so we ran with it. I wanted something that was a bit of a departure from our regular line-up, so my thought was to keep it simple, which is generally the mantra I try to follow when designing something, but also to keep it fun and loose. My vision was to have a bit of a "comic" like look to the cans which I feel comes across in the end. The comic book style definitely feels appropriate with everything that’s going down at the moment and whilst we don’t advocate self-medication here at CraftCans.Ca, sometimes the best way to preserve your sanity is to grab your buddies, head to the lake or beach and crack open a cold one or two and just enjoy yourself. These crushable summer brews are superb sunny day beers so sit back, take a sip and forget about everything else. It’s gonna be great. Huge. Trust me. Check our recent posts below, or click here to see 'em all! They say write about what you know, so we’re keeping it local again with Vancouver based gypsy brewers Superflux Beer Company. Superflux are something of a local legend around these parts. Founded at Callister Brewing’s incubator as Machine Ales, Superflux are one of those breweries whose beer has historically sold out as soon as it has hit the shop floors. Ironic, given the name. To stumble upon a four pack of their bright, bold and beautiful cans of magic is to strike liquor store liquid gold. Superflux Beer Company are walking proof of the concept of creative limitation. Despite being of no fixed brew space and, presumably, working to pretty tight margins Superflux have consistently pushed out a range of complex, delicious beers that have had lucky lips a smackin’ tongues a talkin’ across the city and their success is starting to show through in their branding. Their early 355ml can designs had a definite brewed-in-my-backyard romance to them with their thin stick-on labels, each one of which was painstakingly applied one by one post-canning run, something that almost certainly played to their favour in a community primed and ready to root for the underdog. Now brewing out of Strathcona Beer Company's brewhouse, Superflux have both more room to brew and, having moved to tall cans, more surface area to play with. The designs have finally been given room to breathe and are all the more eye-catching and exciting for it. There’s no skipping over these on the shelf. “My process varies from beer to beer but is generally pretty simple. Design the type of beer first and then move to the visual stuff. I think the colour palette is by far the most important aspect; so I start with that. I’m normally inspired by things I see day to day. The most recent label, “Pretty Much Yeah”, was copied from a cool backpack I saw someone carrying a few weeks ago. Then I play with different shape/pattern combos which is the tough part. There are only so many colours and shapes, so making each label unique can be a challenge. And it’s a story Vancouver’s beer scene is keen to keep reading. Head down to Strathcona on a can release day and you’ll find yourself part of a line-up that’s just a few wands and cloaks away from rivalling a Harry Potter book release. Stay tuned for more from Superflux in future, I have a feeling there’s a lot more to come. Hearthstone Brewery on Vancouver’s North Shore is one of those places that seems - quite literally – to have creativity on tap. Head Brewer George Woods, formerly of BrewDog, and Brewery manager Darren Hollet cook up the craft beers “you don’t know you love yet”. Whether it’s a sweet, comforting Graham Cracker Ale, a velvety smooth Chocolate Milk Stout or their refreshing cucumber sour, these beers are anything but ordinary. Unique beers such as these demand design work that sets them apart from the crowd. Naturally, they looked to Barnstorm Creative to design some craft beer cans that turn heads. Lets take a look at two of my favourite Canadian craft can designs to date: Cool Hand Cuke, the aforementioned cucumber sour and Mr Fungi, a chaga mushroom black lager. Originally brewed in collaboration with West Coast Canning (my can-design-addiction-enablers) for their Can City 2016 event, a celebration of canned craft beer, this refreshing, worryingly chuggable brew has to be one of my favourite cans in Canada. I caught up with Ron Fiedler of Barnstorm Creative, the mastermind behind this magnificent craft can, to find out more about the thinking behind this crushable summer refresher. “Since it was a collab with WCC I felt it needed to be a bit separate from Hearthstone’s main brands, more elaborate, fun and celebratory. I wanted to showcase something that would stand out! I’d say he nailed the brief, wouldn’t you? Taking cues from their environment, both natural and cultural, the brewers at Hearthstone recently created a black rice lager infused with a thick chaga mushroom tea and called it, rather appropriately, Mr Fungi. This crisp lager has earthy coffee notes and has a little fun with Vancouver’s well documented love of trendy ‘superfoods’. Rest assured we’ll be keeping our eyes peeled, our ears to the ground and our tongue to the tap to keep you posted on any new arrivals! For the first of our “Across the Pond” Features, we're taking a trip to England to visit Leeds based brewers Northern Monk. I was fortunate enough to live in Leeds for three years while at university, but unfortunate enough that those years came to an end before Northern Monk really got themselves established. As the UK craft beer industry boomed, the North’s answer to Mikkeller has gone from strength to strength and has since taken the kingdom by storm. Their success is as much due to the quality of their beers as to the strength of their can designs and the reputation they’ve built. Last year they commenced their Patrons Projects series – a range of collaborative, creative, craft brews showcasing the craftsmanship of Northern Monk’s brewers and local artists alike. In essence, the Patrons project is the embodiment of what this blog aims to celebrate: the canvas that is the can and, of course, the beer (or beverage) within. These cans take it a step further with Peel-and-reveal labels that let you take in the artwork in all its glory and, post-peel, reveal a bit more about the creative process behind the beer. The first batch of Patrons Project beers I came into contact with were brewed in collaboration with Leeds-based photographer Tom Joy and acted as a sort of mini photo exhibition that traded gallery walls for fridge shelves. At the time of release I worked in an independent liquor store selling exclusively craft beer and these cans took my breath away, as did the beer itself. The idea of can as canvas is fully embraced both outside and in. Tom Joy’s evocative photos adorn three iterations of a coffee porter each infused with a different single-origin coffee bean from local coffee roaster Northern Star. Next up came two collaborations with Manchester based street artists Nomad Clan and Kentucky based brewers Against the Grain. Smokin’ Bees is an imperial whisky smoked honey porter made with organic honey and whisky barrel chips and features a stunning pen and ink illustration that brings together elements of the artists’ northern heritage with the delicious ingredients in the beer. PBJ is a somewhat more playful and incredibly indulgent peanut butter brown ale presented to you by a big surly peanut lit by the light of a neon jelly sign. What’s not to like here? Patrons Project 4.01 is a Passion Fruit Lassi IPA featuring the mind-blowing art of Drew Millward, which was recently followed up with a Pineapple & Grapefruit Juice IPA with yet more eye-burstingly bright print work. Rumour has it when asked what sort of beer they should brew, his answer was simply “Um Bongo”. 4.02’s primate adventurer peeks out from an avalanche of tropical fruit over the city skyline drenched in colours not dissimilar from the classic Um Bongo adverts. I would like these prints on my wall. All over my walls. I would like every surface covered. Northern Monk’s Patrons Project is pushing the boundaries of craft beer, can design… and craft beer can design. Peel-and-Reveal labels make these beauties virtually collectible items and I know that if I was in England still, these glorious works of art would likely have been peeled off and stuck over any available surface. It’s a game changer for both the artists and the brewers. Each can release guarantees the artist an in-person audience equal at the very least to the size of the can run, with the addition of all those who pick up the can and marvel at it in the shops, plus all those craft beer / design fans across the world on Instagram and other social networks. For brewers the eye-catching designs guarantee some “oohs and ahhs” if not immediate purchases and set them well apart from the rest of the beer fridge. What better way to start this blog off? Follow us on facebook, Instagram and twitter to stay up to date with new posts and see what Canada (and occasionally the rest of the world) can do to keep up. Join us soon for Part 2! 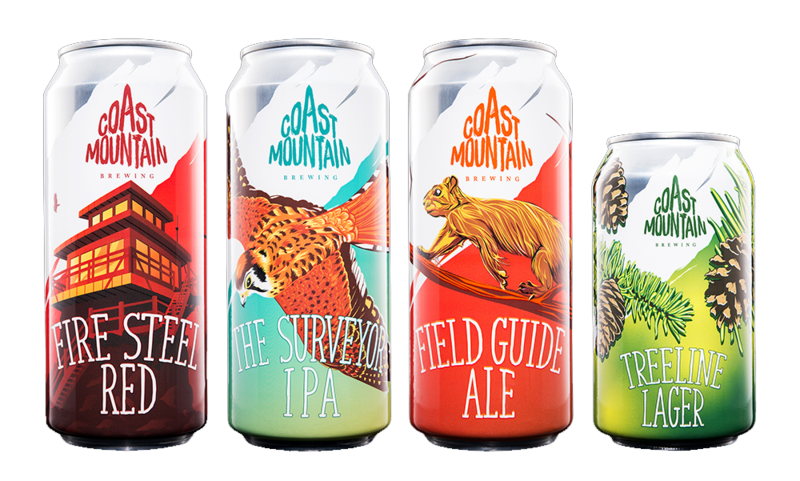 For Coast Mountain, a new craft brewery in Whistler, BC looking to celebrate the great outdoors, we were tasked with creating a brand that feels bold, adventurous, and dynamic. We decided to design a brand mark using hand-drawn letterforms with thick, textural strokes, rising to a rocky peak with the central “A. For the cans, custom illustration and typography in the close foreground give each beer their unique personality, while the strong diagonal silhouette of a mountain range in the background serves as a unifying brand element and creates a sense of depth and dynamics, with a shot of the can’s silver showing through for the final shimmer.